With all the publicity given to forensic accounting these days and thought of as a fairly recent aspect of the accounting profession. In fact, as a concept, it has been around for centuries which is often traced back as far as 3300-3500BC, the scribes of Ancient Egypt, who were the accountants of their day and were involved in the prevention and detection of fraud. In the early 1800’s anassociation developed between the accountancy and legal professions, with accountants acting as expert financial witnesses in court cases. In the 1930’s in America, Eliot Ness got all the publicity in the case against Al Capone, but in fact, it was the work of Elmer Irey, an accountant with the Internal Revenue Service working behind the scenes, who ensured Capone’s conviction for tax evasion. He was probably America’s first high-profile forensic accounting expert. So, far from being a new practice, forensic accounting has long been a part of the accounting profession. While it took a back seat in the early 20th century but now it is gaining back momentum. However, it is surrounded by some mystery so we are going to clear up the confusion regarding it. Forensic accounting is a specialty practice area where accounting, auditing, and investigative skills are used to analyze information that is suitable for use in a court of law. Forensic accountants are engaged to measure damages in cases related to fraud and misuse as well as on matters involving business disputes, business intrusion, insurance, individual damage, ecological harm, cyber-crime, products liability, and business valuation. Forensic accountants are also known as investigative auditors and forensic auditors. Forensic Investigation – the utilization of specialized investigative skills in carrying out an inquiry conducted in such a manner that the outcome will have application to a court of law. Forensic Audit – it is an examination of proof with respect to an announcement to decide its correspondence to set up criteria carried out in a manner suitable to the court. External Audit – an audit performed by an auditor engaged in public practice leading to the expressions of a professional opinion which lends credibility to the affirmation under examination. Apart from this, they can serve as consultants or expert witnesses as well as collaborate with other experts when required. Forensic accountants are sometimes relied on to train internal auditors and investigators and help gauge an organization’s vulnerability to issues such as fraud. What Events Would Constitute Forensic and Investigative Accounting? Forensic and investigative accounting is done in the event of professional negligence claims, detection of fraud by employees within the organization, settlement for a retiring partner, and criminal investigation. In addition, to these situations, forensic accountants are also utilized for family and martial law. When forensic accountants are involved in such situations, they help determine unbiased distribution, spousal support, and income available for child support. For criminal matters, on the other hand, forensic accountants assess the accounting systems to ensure finances reflect reality and some specialize in the analytics department of forensics in which they claim, detect, or reconstruct electronic data to detect fraud. The steps of forensic and investigative accounting include Reporting, Data Analysis, Data Preparation, and Data Collection. Difference Between Forensic Accounting and Auditing? The investigation methods of forensic accounting and auditing are quite different in comparison. An audit is done to assess the financial statement of the organization and is conducted by a CPA forensic accounting expert. The auditors evaluate whether the financial statements prepared by the management of a company are in compliance with Generally Accepted Accounting Principles (GAAP). The auditors give their opinion by examining, on a test basis, the evidence supporting the amounts and disclosures in the financial statements. However, a forensic audit may or may not analyze every transaction or look for fraud specifically, but if properly planned it may uncover fraud. The reason being financial statement audits are designed to detect material misstatements and thus auditors focus only on that. The audit reports are used for a wide range of purposes by several different audiences and stakeholders including senior management, audit committee, the board of directors, owners, investors, suppliers and the company’s bank or financial institution. On the other hand, a forensic accounting engagement is conducted by forensic accounting expert and is particularly intended to uncover fraud. The goal here is to find out who committed the fraud, how they went about it, how much they took and how to prevent it from happening later in the future. 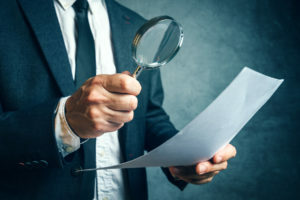 Forensic accounting is more encompassing than a financial statement audit in provisions of assessing the organization’s internal control structure and identification of alleged fraud activity or inconsistencies. Though, in forensic accounting, there are no set rules and the accountants for the most part begin with data from the company’s financial statements and then move to other procedures in an effort to follow specific circumstances or a series of events that have occurred in the company. The forensic accounting expert will talk to company’s work force from the clerical staff to senior management. Based on this, the experts will recognize warnings and design follow up methodology to address the suspicions and high-risk areas within the organization. So, this is all about forensic auditing and accounting and as a business owner, it is imperative that you clearly understand and define your objectives as it relates to an audit engagement as both have different objectives that do not overlap. If you suspect fraud may be occurring in your business or want to learn ways to help prevent it, contact the fraud and forensic accounting expert at HP Accounting. This entry was posted in Forensic Accounting. Bookmark the permalink.